You just acquired a long lasting, pollution fighting Bromeliad. This particular Bromeliad is a member of the genus Guzmania and is indigenous to the cloud forests. With simple care, the bloom inflorescence can last for months. Maintain your bromeliad in moderate light, with reasonable temperatures, and keep slightly on the dry side. Avoid direct sunlight, extreme temperatures and drafts, and do not overwater. Apply weekly 1 fl. oz. of water in the “vase” of each bromeliad – the “vase” is formed by the leaves at the base of the flower. If you apply too much water, simply pour out the excess. Lightly water the soil every 2-3 weeks; allow the soil to dry slightly between waterings. Over watering of the soil or the cup will cause the plant to rot and die within three weeks. 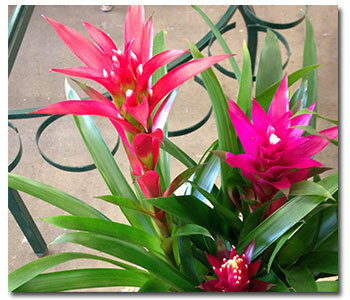 Bromeliads prefer pure water and are sensitive to salts; you will not need to fertilize during the life of your bloom. For more information about Bromeliads, please visit the web site of the Bromeliad Society International. Indoor foliage and flowering plants actively work to purify home and office environments. These plants decrease that amount of indoor air pollution by reducing concentrations of formaldehyde and other volatile organic chemicals. Interiors with plants have 50% to 60% fewer airborne microorganisms and 20% less dust than interiors without plants; moreover plants are able to adjust transpiration rates stabilizing relative humidity to levels ideal for human health and comfort. Research also indicates plants reduce workplace stress, enhance productivity, and cut down sick leave expenses. Bring plants into your home and office and experience the benefits of a clean, well-oxygenated environment. Most foliage plants purify the air during the day; by adding Bromeliads, Orchids, and Cactus, this process continues during the night. For more information about how plants can improve air quality in your home and improve productivity at work, please visit the Green Plants for Green Buildings web site.